Schlock-Wire: Full Specs For Grindhouse Releasing’s Special Edition Blu-Ray/CD Set Of PIECES – Schlockmania! Grindhouse Releasing is blazing a bloody trail of chainsaw carnage in 2016 with the company’s best home video release to date: the highly anticipated 3-disc deluxe Blu-ray edition of the 1980s slasher classic PIECES. Hitting stores March 1, this jam-packed, definitive hi-def set (specs below) comes complete with an eye-popping PIECES jigsaw puzzle (limited to the first 3000 copies, available now for pre-order at Diabolik DVD (link) and Amazon.com (link). Through an exclusive deal with Grindhouse Releasing, Diabolik DVD customers will receive PIECES a week early on February 23 – and get first crack at the limited edition, which is projected to sell out fast. Directed by Juan Piquer Simón and starring Christopher George (Lucio Fulci’s CITY OF THE LIVING DEAD, GRIZZLY, TV’s RAT PATROL), Edmund Purdom (DON’T OPEN TIL CHRISTMAS), Paul L. Smith (MIDNIGHT EXPRESS, David Lynch’s DUNE, and Robert Altman’s POPEYE) and Lynda Day George (MISSION: IMPOSSIBLE), PIECES tells the story of a psychopathic killer stalking a Boston campus, brutally slaughtering nubile young college co-eds, collecting body parts from each victim to create the likeness of his mother who he savagely murdered with an axe when he was ten years old. PIECES was a Variety Top 10 box office smash in its original release, debuting at #5 in its first week (ahead of RETURN OF THE JEDI at #6!). It has remained a favorite among connoisseurs of gore, including director Eli Roth who ranks PIECES as one of his top horror films of all time. 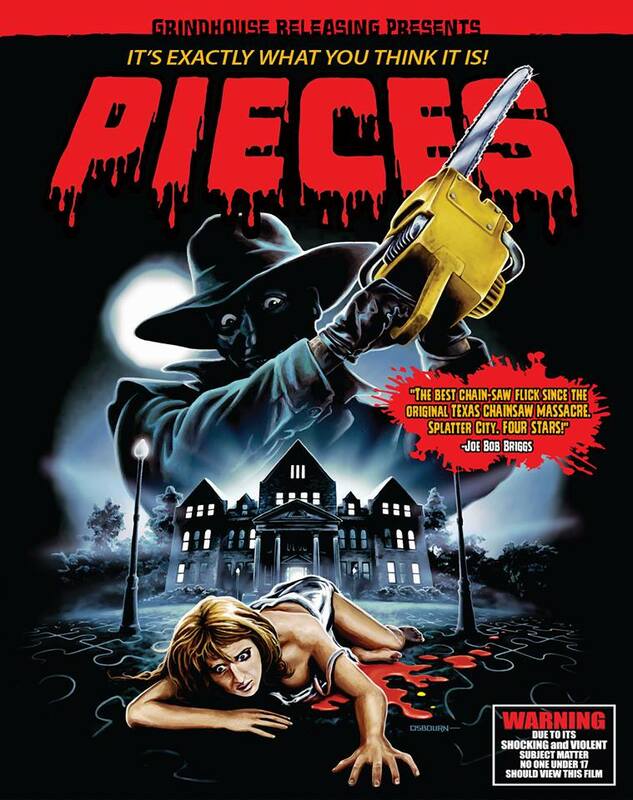 PIECES is the latest in a series of essential horror Blu-ray releases from Grindhouse Releasing, following the best-selling success of CANNIBAL HOLOCAUST, CANNIBAL FEROX, and THE BEYOND. Grindhouse Releasing is known for its lavishly restored, exhaustively detailed releases of cult-classic movies including Frank Perry’s THE SWIMMER, starring Burt Lancaster, which won the 2014 Satellite Award for Best Overall Blu-ray from the International Press Academy, Sergio Sollima’s classic spaghetti western THE BIG GUNDOWN, starring Lee Van Cleef and Tomas Milian, Duke Mitchell’s crime epics MASSACRE MAFIA STYLE and GONE WITH THE POPE. Robert Hartford-Davies’ CORRUPTION, starring Peter Cushing, and Amos Sefer’s AN AMERICAN HIPPIE IN ISRAEL, starring Asher Tzarfati and Shmuel Wolf.